Facing the ocean, the Regina Biarritz Hotel & Spa MGallery by Sofitel invites you to relive the climax of this mythical resort. Let yourself be seduced by the majestic elegance of an edifice full of history. 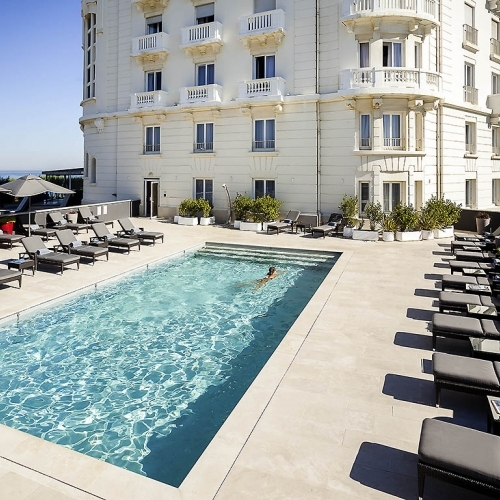 Since its opening in 1907, this refined hotel has received high French and foreign company and countless celebrities. Stay with your turn in this exceptional place in the immediate vicinity of the golf of Biarritz and contemplate the splendor of the bay. Admire the grandiose architecture of the patio, its huge canopy and its many galleries that suggest felted and intimate spaces. The Art Deco style is adorned here with subtle contemporary accents to sublimate the original architecture. In the heart of Biarritz, explore the boutiques bordering these streets which saw the birth of the first couture house of Gabrielle Chanel. Stroll on the beach before regaining the legendary splendor of the hotel and the tranquility of your room.